On 28 April 2015 at the Women’s Power to Stop War Conference for the 100th anniversary of the Women’s International League for Peace and Freedom, Laura Boillot of Article 36 spoke on the key technologies of violence that we are working to confront today: the use of explosive weapons in populated areas, nuclear weapons, and increasing autonomy in weapons systems. She also spoke on how effective campaigns to challenge certain weapons can be organised and built. It’s a real honour to be here on WILPF’s 100th anniversary. I am going to briefly talk through three weapons technologies and the threats that each of these present. First of all, nuclear weapons; second, the use of explosive weapons in populated areas; and thirdly, autonomous weapons, or killer robots. So first of all the big one – nuclear weapons. Nuclear weapons are a big threat because of the sheer scale of the threat that they pose and present to human life. They are the most destructive weapons that have ever been developed in our history, and even the very limited use of any nuclear weapons would cause widespread devastation, killing hundreds of thousands of people and impacting generations to come. Because of the widespread and significant harm that nuclear weapons would cause, they are classified as weapons of mass destruction: yet they are the only weapons of mass destruction that have not yet been banned – although we are working on changing that! They are also big in terms of the political challenges they present. Nuclear weapons, at least to the nuclear-armed states, are seen as more than weapons. They are seen as representing status and power. As a result of the vesting of power in the hands of nuclear-armed states, there has been very little progress over the last few decades in nuclear disarmament. 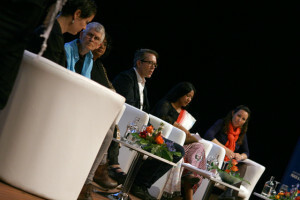 But, the ‘humanitarian initiative’ that has been started by progressive governments like Norway, taken on by Mexico and Austria, and been the focus of campaigns like ICAN’s, has helped to reshape some of that focus and put it back where it belongs, on the unacceptable humanitarian consequences of nuclear weapons. This has given us a new momentum and put the power back into the hands of those who want to see a treaty that bans nuclear weapons. The next threat I will talk about it the every day threat that comes from the use of explosive weapons in populated areas – the bombing and shelling of towns and cities. What we are talking about here is the use of bombs, rockets, mortars, grenades, in areas where civilians are present. Really it is unsurprising that when these weapons, which affect wide areas, are used in urban centres, it is civilians that bear the brunt of the harm that’s caused, making up around 90% of the casualties. Last year we saw widespread use of explosive weapons in places like Syria, in Gaza, in Ukraine. Each day, at least 26 civilians were killed, and a further 80 injured, from the use of explosive weapons. These are very conservative estimates, based on English-Language media-monitoring that one of INEW’s member organisations, AOAV, carries out. The actual casualty figures resulting from the use of explosive weapons are likely to be much, much higher. This practice is not only harmful in terms of the number of deaths and injuries that it causes to civilians, but also from the widespread destruction that results from the use of these weapons on civilian infrastructure. It damages peoples’ houses, it impacts hospitals, it ruins schools, it ruins water and sanitation systems, and it also has long lasting psychological impacts on people. Yet despite this large loss of life and destruction, there is a ’moral outrage gap’ on this issue, and the pattern of harm continues, affecting tens of thousands of civilians each year, in around 80 countries across the world. This practice needs to be called out as unacceptable. Efforts are underway, led by states and civil society through INEW, to stigmatise this behaviour and give it a name, calling it out for what it is. Through INEW’s work and that of states we are working for an international commitment that will aim to stop the use of explosive weapons in populated areas. Lastly, I will say a few words about potential future threats, looking in particular at killer robots. Killer robots, also known as fully autonomous weapons, are weapons that would be able to select targets and attack those targets without human control. What this essentially means is delegating decisions over life and death to machines. This development is coming as a result of a shift and a trend that we are seeing towards greater autonomy in weapons systems. These systems would pose fundamental ethical and moral challenges to our societies and how we choose to relate to the use of violent force. Allowing these systems to be put into operation and be used on the battlefield would also fundamentally change the nature of warfare, and dehumanise it even further. Although killer robots do not yet exist, it is our view and that of the Campaign to Stop Killer Robots that there must always be meaningful human control over the use of weapons systems, and in particular over every single attack. Human beings need to be going through the deliberative process of deciding whether to undertake any attack. The Campaign to Stop Killer Robots calls for an international ban on the use and development of fully autonomous weapons, before they are allowed to be put into operation and it is too late. 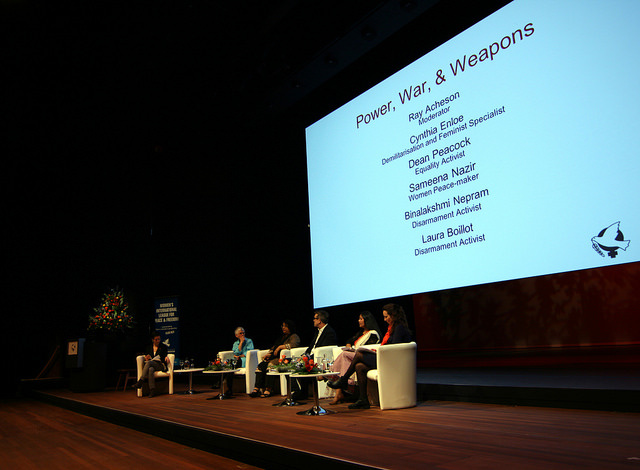 How do we organise and build effective campaigns to challenge weapons? Firstly, it is important to have a strong focus on the human impact of the weapon. Often our role as civil society is to demonstrate the harm that weapons have on people, and more often than not, on civilians in particular. This is not to say that others don’t have a responsibility to do this, but it’s a recognition that most often they don’t look at the human impact. And so it falls to civil society to show the human suffering and be the voice that says – this is unacceptable and it must stop. NGOs have played a central role in highlighting the human impact of weapons in their campaigns, through their messaging, materials, using imagery and increasingly today footage and by sharing human stories and testimonies about the harm we are working to prevent. NGOs have also provided reliable, and authoritative data and evidence documenting the harm caused by particular weapons. Often this data has been quite conservative, this is because of limitations on getting a comprehensive picture of the problem, but even conservative estimates have painted a picture of a situation that is bad enough, whilst not overstating the issue, and so has stood up to scrutiny by opponents. 1. The cluster bomb campaign – and before that the landmines campaign – had a very clear focus and objective: a ban on a particular weapons system. This has been important to organise supporters to the cause, for example getting organisations to join the campaign, and mobilising people to take action on an issue and around a central message. Ban cluster bombs, ban Landmines, ban nuclear weapons. 2. Global reach. The Cluster Munitions Coalition had active members promoting this central message – a ban – in over 100 countries around the world. It was diverse in membership, linguistically and culturally. Some of the members were large organisations with public reach. Others were much smaller organisations, but all were actively engaged and promoting a ban with key contacts within their governments, policy makers, parliaments, and with their media. 3. Good communications. Much of this is internal, to grow and nurture a successful campaign. A combination of listening to and being driven by the membership as well as providing clear direction and leadership as needed is crucial. Making sure that there is space for campaigners to meet to plan, share information, develop common strategies is key – often on the margins of other governmental meetings. Lastly some brief remarks on strategy or approach. 1. Building strategic partnerships has been an essential ingredient – building partnerships with states that will help to lead a diplomatic process, and international organisations, and building personal relationships with individuals in these institutions to share information and to make sure there’s a coordinated approach to opportunities that are presented and also problems that arise. 2. Move quickly and keep up momentum. This can help build a sense of inevitability of the outcome. 3. Believe it is possible – both that it is necessary and achievable Many will doubt you, until you’ve done it of course, and then they’ll tell you it was inevitable!